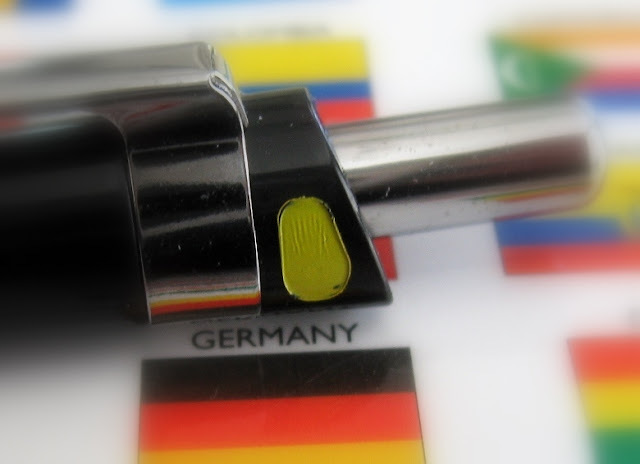 The German company Rotring is one with a proud heritage, a name that has long been synonymous with superior technical drafting equipment, including mechanical pencils. In more recent times though they have become one of the Sanford brands and undergone some changes that have at times left many onlookers confused and surprised. 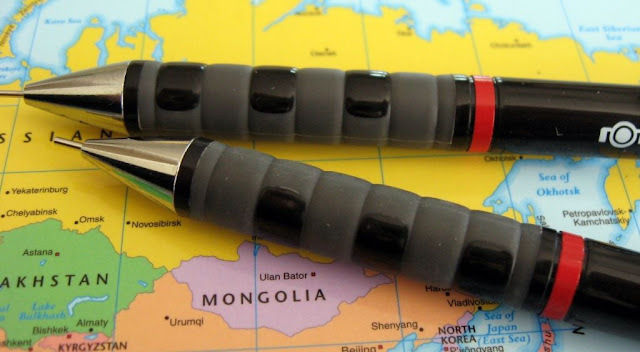 A large number of their products have been discontinued but one of the survivors is the subject of this review, the Rotring Tikky mechanical pencil. In the Rotring 2008 catalogue, aside from the Rotring 300 clutch pencil, the Tikky is the only mechanical pencil featured and in fact it is shown logoed as the “Papermate Tikky by Rotring”. As at the time of writing this review the Tikky and the 300 are the only mechanical pencils on the Rotring website. 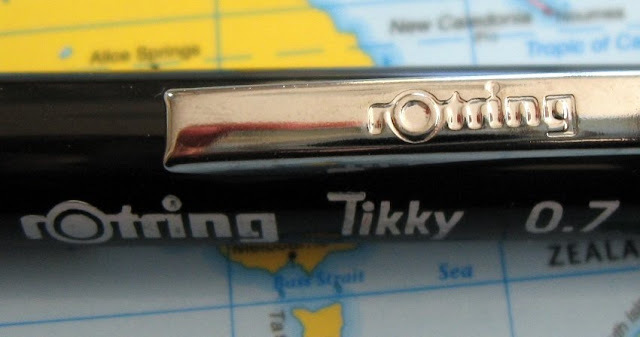 Unlike the catalogue, on the website the Tikky is shown branded solely as Rotring. If you search the web you will also find what certainly appears to be the Tikky available as the “Papermate Precision” mechanical pencil. Like I say, a mix when it comes to Rotring. The Rotring Tikky mechanical pencil is currently available in four different lead diameters, labelled as 0.35mm, 0.5mm, 0.7mm and 1.0mm. 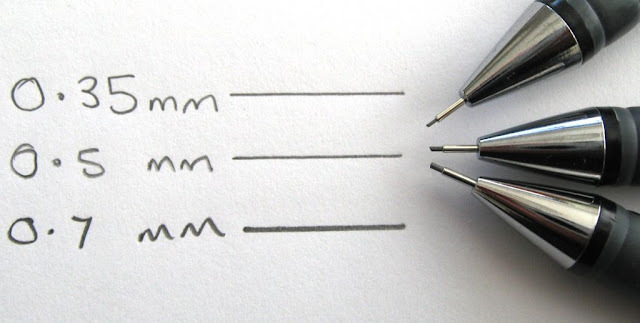 Don’t be confused by these lead diameters, Rotring are using some less common designations and the 0.35mm is the lead that most others call 0.3mm, and the 1.0mm is what is usually called 0.9mm. 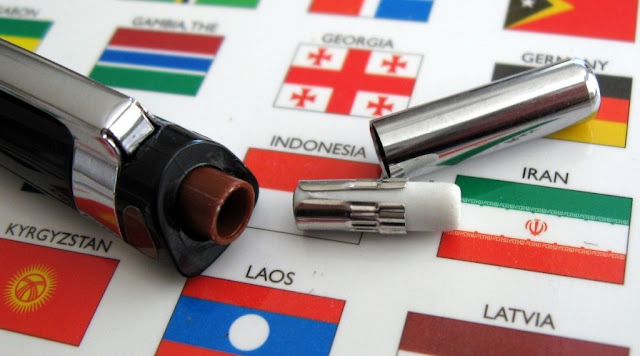 So to re-state that, the Tikky is available in 0.3mm, 0.5mm, 0.7mm and 0.9mm, despite what’s printed on the pencil itself, and what the true diameters of the leads are. As well as selling by the individual pencil, Rotring offer a Tikky three-pack of 0.35/0.5/0.7mm which is what I have for this review. As you might expect, the pricing on the three-pack is advantageous compared to the singles. Now that I’ve become aware of this three-pack I think it’s a pretty good marketing idea and I’m surprised other brands don’t offer something similar. The Tikky is a fairly attractive looking pencil. The base colour is black, but it’s got a hint of brown in it in some lights. The whole package of chrome appointments, glossy black/brown upper body, white logo printing, red Rotring ring and interesting grip section all combine to make a visually pleasing whole. For those of you who like lighter colours, some versions of the Tikky are also available in a wide selection of other colours. The grip section is the most eye-catching aspect of the Tikky. It is a hard grey rubber, moulded around rectangular sections of the body. Overall the traditional Rotring Tikky wave profile is kept but a rather visually intriguing pattern is created. The grey rubber is very hard and not particularly grippy, so whilst the grip looks good, it is only average in actual use. Weighing in at about 12 grams, the Tikky is a medium weight pencil but it is balanced towards the tip. The weight, balance and grip zone combine to make it feel quite good in the hand. The pocket clip on the Tikky is a rather impressive affair. It is very firm clip that won’t be coming accidently loose from whatever you attach it to. I really like the clips long flowing profile. The clip is attached to the body by two wings that are folded around and onto the body – it’s a class act that shows some genuine quality of manufacture. The lead diameter of the Tikky is indicated by a coloured section up near the top of the pencil. Yellow = 0.35mm, brown = 0.5mm, etc. The lead size is also printed on the barrel. Well, the lead dot colour indicator is a nice idea, but I’m not particularly convinced of its practicality. The Tikky is advertised as a “technical writing” pencil so far more useful to me would be a lead hardness indicator, which the Tikky does not have. The Tikky is a standard push top button ratchet advance mechanism pencil. Ten clicks of the 0.5mm model will get you about 8mm of lead. The lead sleeve is a 4mm thin metal pipe so definitely suitable for draughting work, although I imagine that’s ‘drafting’ in the Sanford lexicon. The Tikky’s sleeve is a fixed non-retractable sleeve, so it’s not pocket safe. As you might expect, there is a small emergency use eraser under the push top button, and you pull that out to access the lead refill magazine. Rotring is stamped into the pocket clip. Markings printed on the body. Despite the recent changes and other carry on with the Rotring brand, the Tikky is a class act and I’m tempted to think this latest incarnation is an actual improvement on it predecessors. Product evolution as it should be. Best Points – It looks good, especially the grip and pocket clip. Not So Good Points – Nothing really bad, but I would swap the lead size indicator for a hardness indicator any day of the week. Does this pencil make it into the Top 5? - No. Dimensions – Length 141mm, diameter 9mm. Balance point about 60mm up from the tip. The set of three Rotring Tikky mechanical pencils featured above were given to me by Euroffice, an office supplies specialist in the UK, in exchange for a review of the pencils and this acknowledgement. Ahh. That post sent me off to find the Rotring 600 and that rarest of beast, the 800. For now I can only look. Still looking at the all-metal 800s reminds me of a comment made by an artist friend a while ago that plastic only looks worse with age while many other materials gain character with age. Nonetheless, I like the design for the grip on these Tikky's. "Now that I’ve become aware of this three-pack I think it’s a pretty good marketing idea and I’m surprised other brands don’t offer something similar." Actually it's quite common in Central and Western Europe. For example in Vienna all the big ones have their 0.3/0.5/0.7 three-pack (Staedtler Mars Micro, FC TK Fine, rotring Tikky, AristoGeo, etc.) In Bratislave/Slovakia there is a Koh-I-Noor store where you can buy the Mephisto 3-pack (which is interrestingly 99% identical to the Aristo D1 model). Lastly in Hungary I've seen an unusual rotring 3-pack. Two 0.5mm VISU pencil plus a ballpoint pen. I never heard of the rotring VISU Pencil. On the cheap side they always had the decent Tikky. I haven't seen this model sold individually either. Have you heard of this model? Or maybe Gunther from Germany? Hi Anonymous. Thanks for that info on 3-packs, very interesting. The VISU doesn't ring any bells. similar grip as the Tikki. It has a metal clutch mechanism. Just for the record, I just e-mailed you the scan of the yesterday mentioned rotring VISU Pencil 0.5. Well, the scan is pretty bad but maybe you can get an idea. To Jaz: in April I've seen the Precision in a WalMart (in Montreal), it was burgundy in color and as far as I can remember it was 0.5mm. I might be wrong. However I can mail you one or two original rotrig Tikky0.5 or 0.3mm pencils, if in turn you could send me few TUFF STUFF 0.4mm ereaser refills. 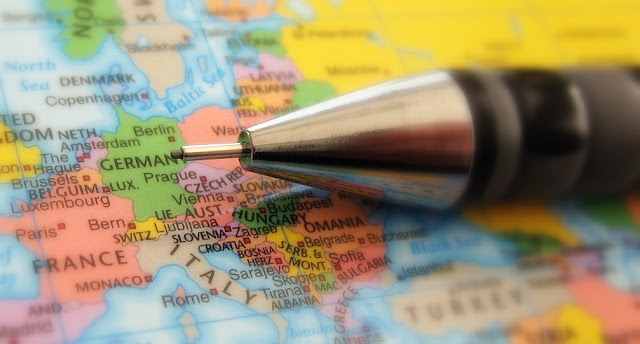 Interrestingly I can't find 0.4mm sticks in Europe... I miss them badly. @che pablo: The Rotring 800 is no rare beast, it is again in production. There is a steady supply on this famous auction site. Also the Rotring 600 is in production , e.g. pencils.jp sell them for 2000Yen. Some say the original old are better, but I can't see these differences (or maybe all my Rotrings are new ones??). I collect the 600-pencils in all versions, I have 25 now. In my ebay searches the "rotring 600 -tikky" is inalienable, they are so ugly. Anonymous of the 600. Whilst you have 25, I have zero. I would be very interested to publish some photos of your 600's on this blog if you were interested at all. You can contact me via my email on my blogger profile (About Me in the sidebar). I hope to hear from you. Actually, the invitation is of course equally open to other 600 owners. I would like to include this review in the 4th Carnival of Pen, Paper and Pencil that is coming out on Tuesday Nov 3rd. Please drop me a line ASAP. michaelramm AT gmail DOT com. the tikky is a fine looking pen. i like the look of the clip. i´ve been following your blog for a few months now and i really have to say it is a great thing. thanks for doing all this reviewing work!! i´m really glad you did a review of the tikky 3. i bought mine about 8 months ago and it has become my most used pencil. i´ve tried several other mechanical pencils but this one is the best (from my point of fiew) and especially for the low price. i can only recommend this pencil, i haven´t had any problems with it so far and i think there won´t come up any. Good to hear from Austria. Glad the Tikky is working for you. Hmmm, hadn't though about this before, but does Tikky mean anything in German? Slang for anything? as far as i know it is only a name. This is just guessing but the Tikky name might has to do with rotrings first best seller called Tintenkuli. 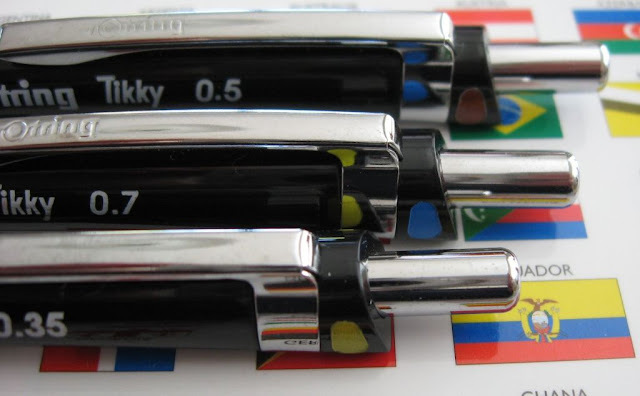 The Tintenkuli when became world famous was used as Tiku too and it became so famous that I assume for their first aspiring pencil they didn't want to use some technical name like XC565 but called it Tikky. But this is really just guessing. 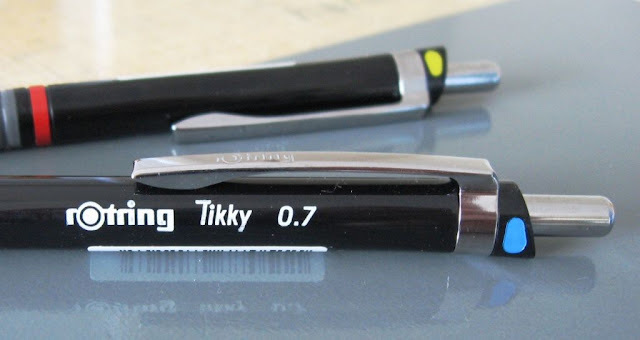 According to the rotring website, the Tikky is also available in 1.0 lead size and as a ballpoint pen. Nakkaka - do you mean when you push the top button down to advance the lead a whole stick of lead just drops out the tip? If so you probably have refilled with the wrong (too small) lead size. I assume it all worked OK when you first bought it? I have a tikky pen and it's my favorite writing instrument so far. I'm hoping to get the pencil one day. The pens default ink cartridge was mediocre though, so I replaced it with a gel and now it's a beast. I had a Rotring Tikky double push pencil and it lasted over 15 years until I lost it. Bought one of these new ones and it broke within a year. I wrote Rotring and received no reply. Thus ends my use of Rotring pencils. Hasn't anyone noticed that tikky 3's mechanism is way worse than the first two?When you push the top it doesnt sound and feel like the same quality with the other two.Maybe it is cheaper spring..